Its really interesting, and you should deffo give it a read (its not very long), its from January so its not a very recent article but the issue discussed is relevant and still a wide topic of debate. I was shocked and nervous to read that most runway models meet the body mass index for anorexia....which is just not right. However, because of the nature of the industry I think this will always be the case- its the way its always been! Needless to say their were lots of people who commented on the article...with a wide range of differing opinions. In this industry there is a lot of pressure to look your best at all times and it often gets competitive, especially with the fickle nature of it. When I went to an all girls school there was a lot of competitiveness concerning eating and at the time it was the most important thing in our lives but now me and my friends look back and think : we were such twats. 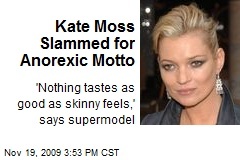 Kate Moss caused controversy a while back saying "nothing tastes as good as skinny feels" which in a way I can understand. But then everyone has their own happy weight where they feel 'skinny,' so such a broad term and I think what she meant was misconstrued. But it is a shame that these days teenagers, who are easily impressionable, are under pressure. For example, I have Tumblr account. Tumblr's main audience is young people aka teenagers and there are so many 'thinspo' and 'dieting' posts that come up on the newsfeed, without even looking for it, its there- which is not healthy. Ultimately, I think its not the size of your body but how you use it. I don't think size matters, as long as your happy! ;) hahaha and I'm still talking about body image guys! As long as you feel healthy in yourself and are happy with your appearance I say why should anyone else give a sheeeeet?! Whats your take on all of this? Whats your opinion on runway models VS plus size models? I know this is a controversial subject but I hope I've gone about talking about it in the right way! Well said i completely agree with everything you've wrote here. I always thin its misleading when they use models to advertise clothes on websites, and then they end up looking the complete oppisite. I'd kill or a model figure but i'd much rather eat what i love and have the figure i have now.